I cannot believe it is now May, this year seems to be going so fast! But as much as I feel time is running away with me I am also super excited for the summer to be getting closer and closer. May is an in between month for me where I feel like it's almost summer but not quite, its almost warm enough for bare legs and sunbathing but not quite and although I love a picnic in any weather we still need a good jumper to enjoy eating in the garden. When I first saw this dress in a shop whilst on holiday in York I couldn't help but picture me wearing it in the sunshine, preferably in wandering the vineyards of Italy. Unfortunately I think my summer will mostly take place in Oxford but I could still see a real place for this gorgeous tea dress in my wardrobe. It was however, a little out of my budget so I left in York and returned to Oxford only to find a few weeks later it had been put in the Lady Vintage sale. I knew I had to have it and am so glad I ordered it. 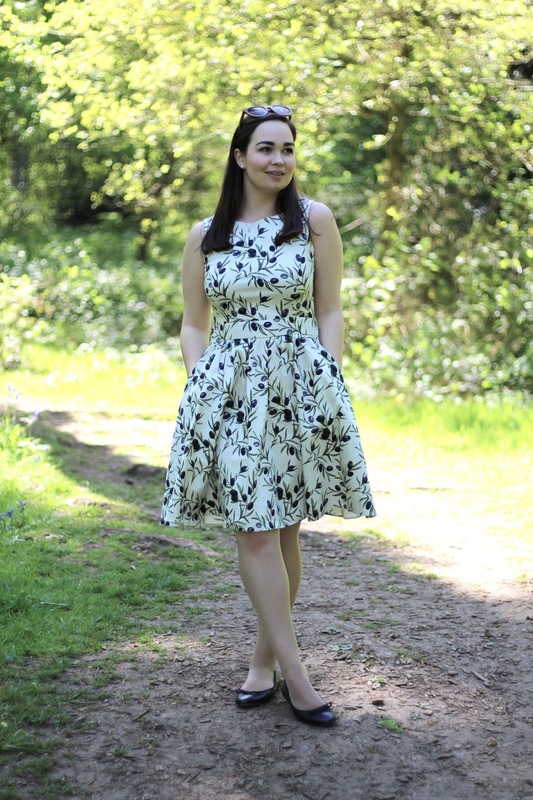 Lady Vintage is a new brand to me but its one of the only vintage remake brands I've managed to find that have a more ethical way of creating their products as all their clothes are made in the UK. A big part of me trying to shop more ethically for clothes is to buy locally made and so finding a brand with such gorgeous and comfortable clothes made in London is a real jackpot. I'm also planning to keep it in my wardrobe long enough to be able to take it to Italy when Russell and I do manage to make it over there! cheers!...cheers!...cheers!...waht a super nice photos and a stunning outfit of yours!...great post!